Of Tides and Trees: The rise and fall of Shipbuilding in Maitland, N.S. Nova Scotia’s shipbuilding industry boomed during the second half of the nineteenth century. This was Atlantic Canada’s ‘golden age of sail’. But within a handful of decades – by the end of the 1870s – the demand for wooden ships began to decline. Our paper examines one small, but important, component of this story. Maitland, Nova Scotia is a tiny village located at the mouth of the Shubenacadie River in the upper reaches of the Bay of Fundy. Although a small village today, it was a bustling shipbuilding town during the latter half of the nineteenth century. The ships built in the village were some of the largest in Canada and once launched, the vessels, which were often owned by local shipbuilder, visited ports in Europe, South America and Asia. Amateur and professional historians alike have studied the decline of the ship building industry in Maritime Canada. In the past these historians have focused on major ship building communities such as Saint John, NB, Yarmouth, NS, Windsor, NS, and Pictou, NS. Their explanations for the late-nineteenth century decline range from a simplistic focus on the increasing prominence of iron hulled vessels in the deep sea shipping industry to a reallocation of investor capital towards more continental investments like the railroad. This paper takes a different approach. Rather than examining the economics of the shipping industry, we focus much more on the role of Maitland’s environment and resources as factors shaping this local – and yet international – shipbuilding and owning industry. Maitland’s environment played a central role in shaping how this community experienced the latter half of the nineteenth century. There were two key aspects of the environment that made Maitland an ideal location for shipbuilding. First was the river itself. The Shubenacadie River was central to all of the people who lived in the region. The Mi’kmaq used the river for fishing and the reeds along its banks for basket making. The Acadians built dykes around the salt marshes at the river’s mouth. And for the English ship builders, the river reduced their capital costs, as they could build the ships on the beach without using a dry-dock, using the bay’s high tides to launch their vessels (see the photo of Maitland’s largest ship, the W.D. 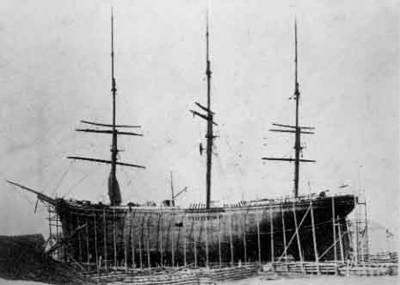 Lawrence under construction in 1874). The Bay of Fundy is shaped like a funnel so that twice a day every day all the water at the wide end of the funnel is forced into the narrow channel, creating the highest tides in the world, ideal for launching large ships. The second reason was the availability of raw material. Much of the local oak, a hardwood, was exported to England for the Royal Navy. It was prohibited for the locals to use this as the primary wood in their ships. But spruce was available in huge quantities. It was a soft wood, which shortened the life span of these ships, but it was light and when compared with the hardwood usually used in vessel construction, it was relatively easy to repair. 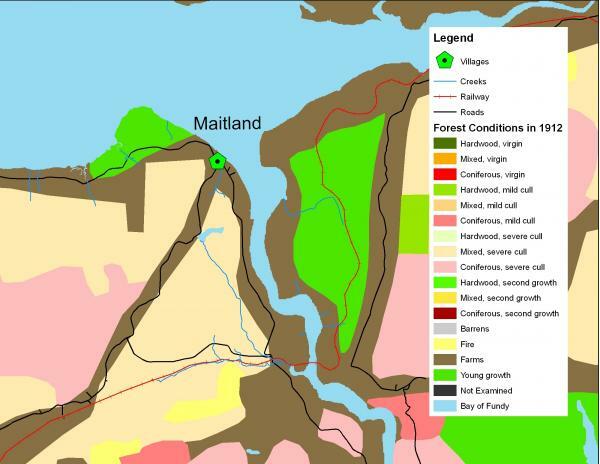 The two preliminary Geographic Information Systems maps included here demonstrate the important place that Maitland’s resources played in developing this industry. 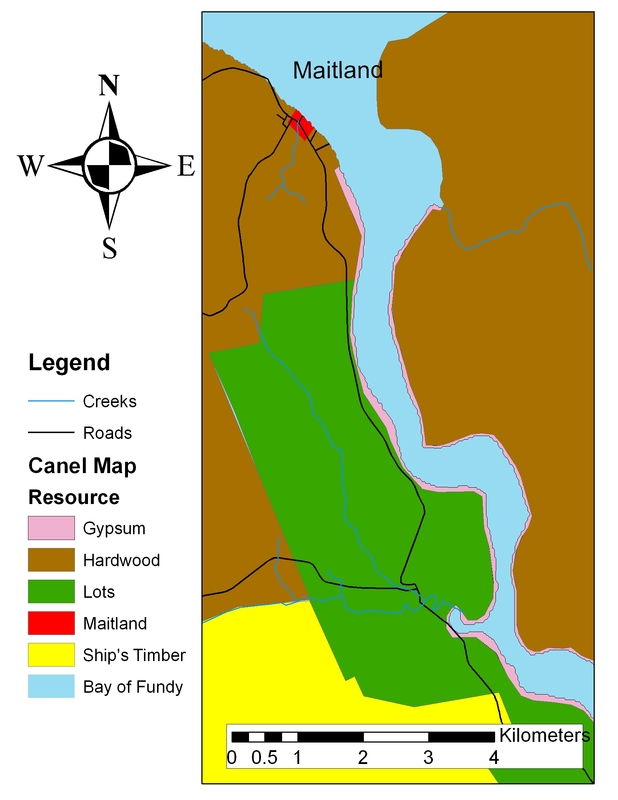 The first map, based on an earlier map created during the building of the Shubenacadie Canal, in 1828, show some of the natural resources available in the Maitland area early in the nineteenth century. Stands of hardwood were located at the mouth of the river. Further inland shipbuilding timber, presumably spruce, served as the backbone of this industry. Gypsum and some limestone lined the riverbanks. The rising demand for gypsum in the United State in the first half of the nineteenth century appears to have spurred the early development of small-scale shipbuilding in Maitland. The second map, which represents a survey of the Maitland forest conducted in 1912 demonstrates the way that the shipbuilding and forestry industries transformed the landscape around Maitland. There were no longer any virgin stands of forest, nor did much hardwood remain in the area. Most of the forest landscape had been severely culled. Farming, and the road infrastructure to support it, had also blossomed with the growth of shipbuilding. Stanley T. Spicer, Masters of Sail: The Era of Square-rigged Vessels in the Maritime Provinces, (Toronto: The Ryerson Press, 1968), 56.